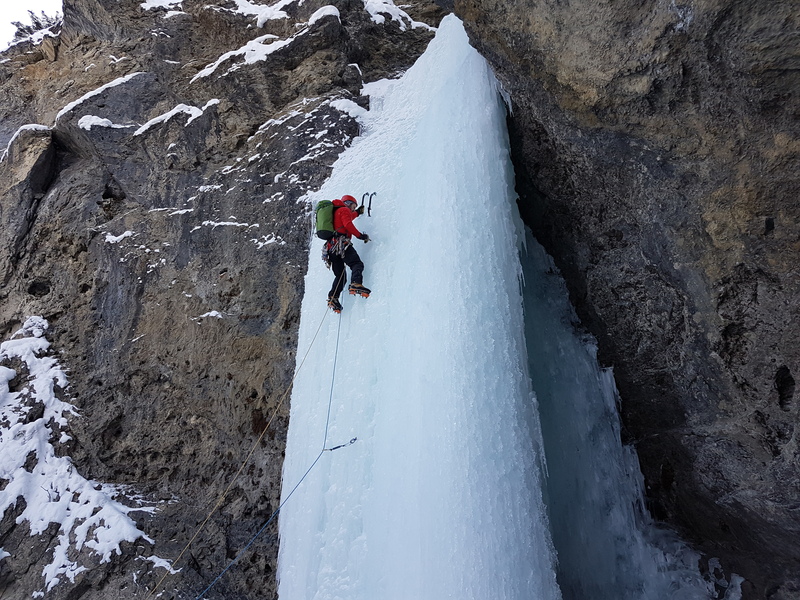 This is another of series of Rockies classic ice climbs. A must do for all that come here. It was the second time for us, having done it on last year’s trip. 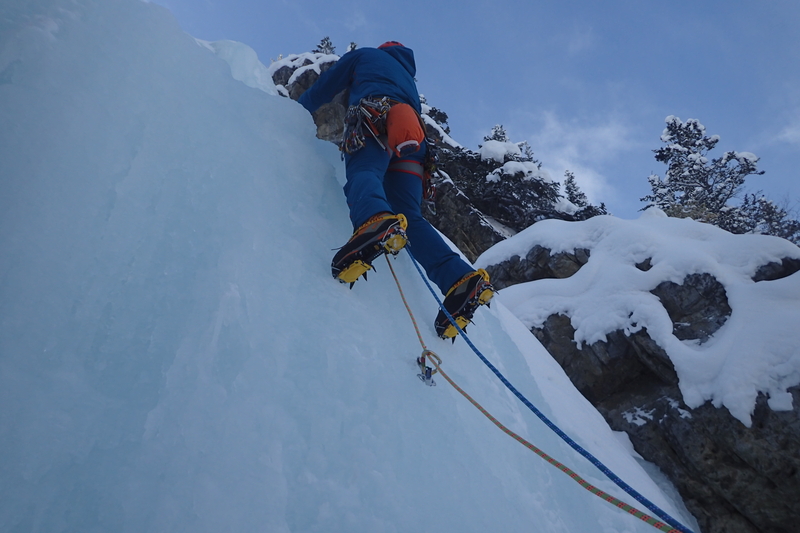 But as it very often is with ice climbs, it doesn’t mean it will climb the same. As a matter of fact most of the pitches were in very different condition comparing to 2016. But more about it later. 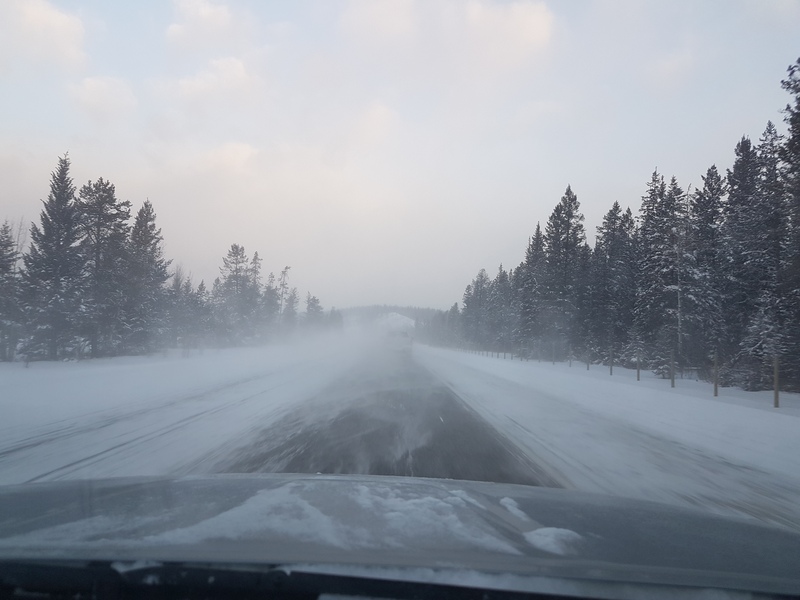 We got up early (not quite alpine style, but good enough for PG’s standards ;)) and hit the road towards Banff almost straight away. 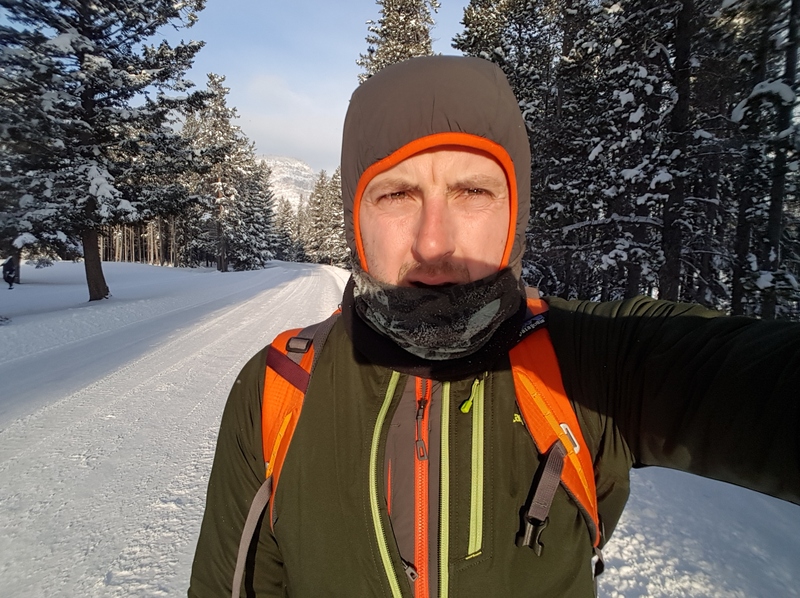 The climb itself has quite a long approach (by the Norway standards we got used to in Rjukan) – over 7km with 12kg in our backpaks and almost -20C outside isn’t easiest of the days. 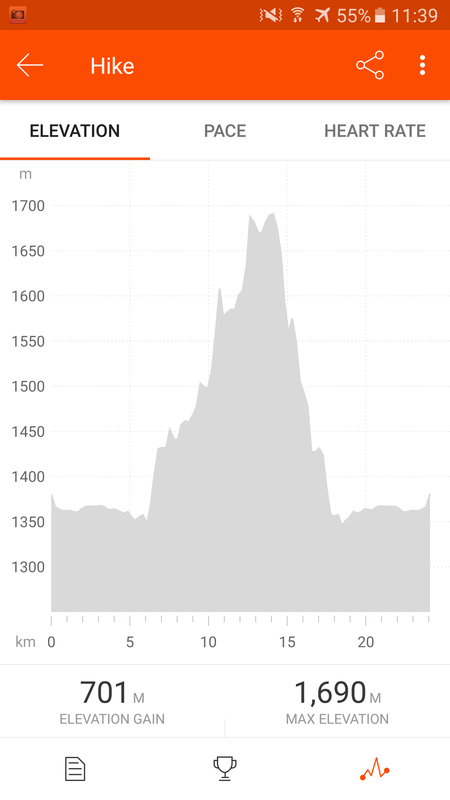 metrics captured by Strava app via gps in my phone. It might not look at it, but I must say though that despite the cold I actually enjoyed the walk. 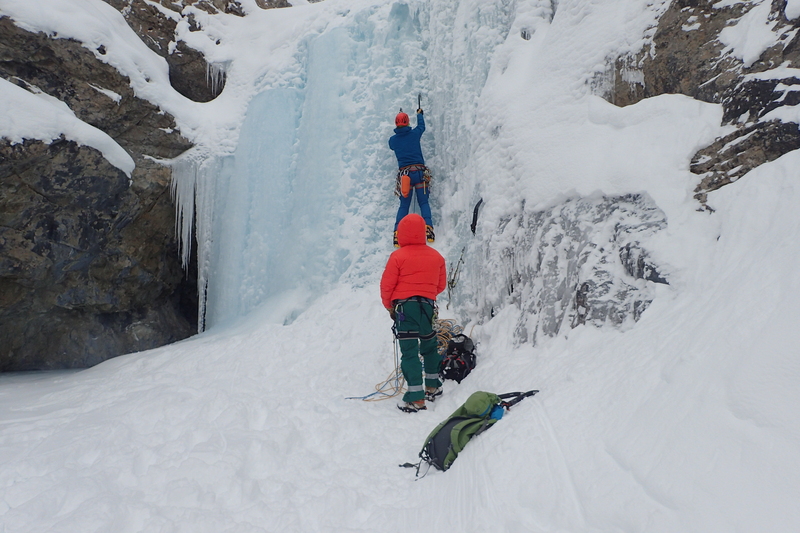 It did make the climbing difficult – Ice at -20C is not the best medium. Not only the ice is super hard, but everything freezes instantly. The biggest problem being frozen ice inside the screws almost impossible to get it out. Add hot aches in the hands, and it can really take out much out of you. I experienced it first hand (no pun intended) at the end of first pitch. For those few minutes I really felt bad. No words can describe it. You have experience it yourself to understand. 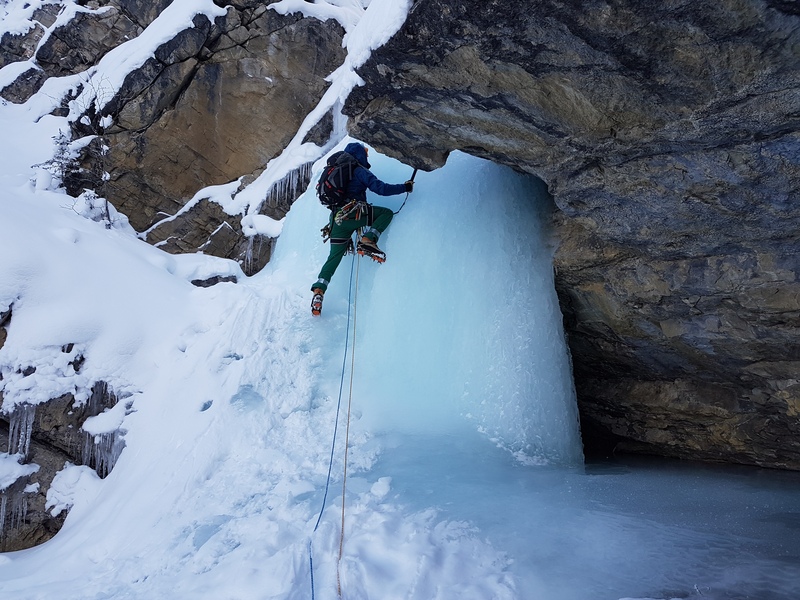 The climb itself is around 250m and can be dived to between 5 to 7 pitches, with some walking between them (no hanging belays). 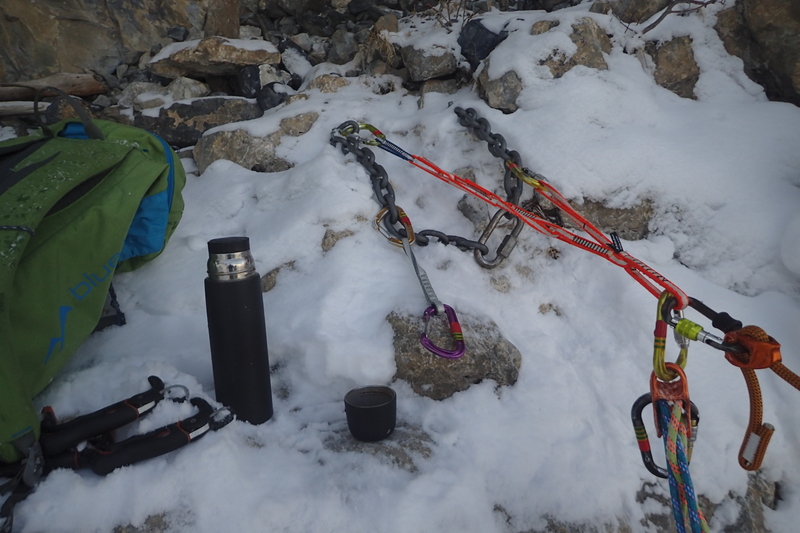 Some of the section are often climbed together (joined), hence the different configurations. The Professor Falls from the bottom of the drainage path. Up above the rest of Mount Rundle. PG led the first two pitches. They’d be in prime WI4 shape. 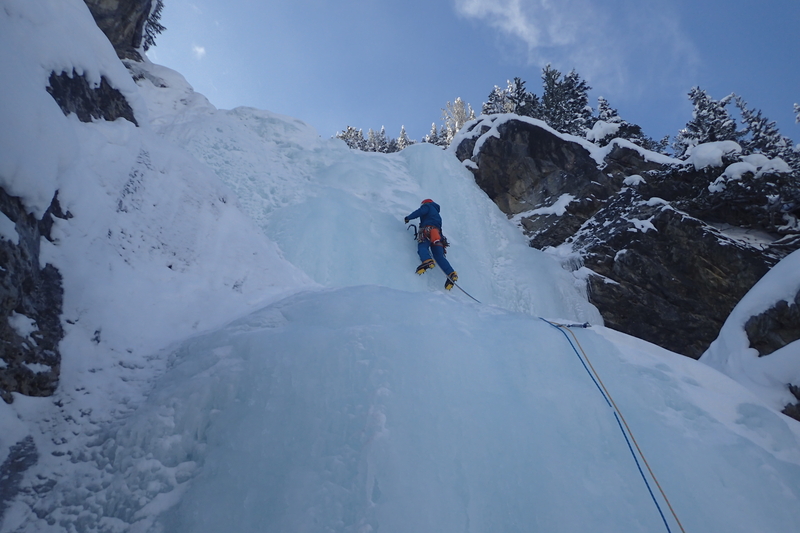 After that there was a small WI3 step, that normally is run a part of previous pitch, but we decided to pitch it separately. Lar grabbed the rope for this one. That leads to what we call the ‘tunnel pitch’. 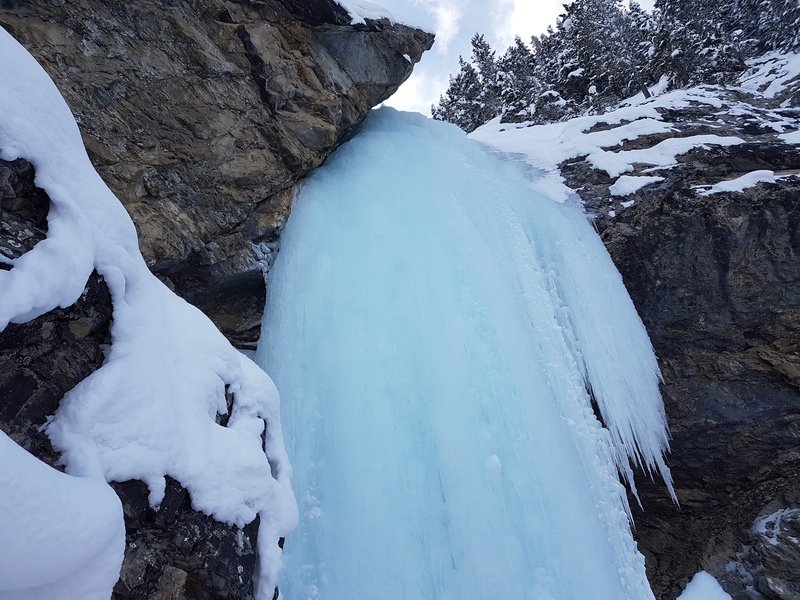 Last year it has a huge free hanging icicle on it’s left hand side, making you to climb under it, in a tunnel of a sort. This year that feature wasn’t formed, and it was just a normal WI4, that PG very much enjoyed. Next it was my turn to grab the sharp end of the rope. 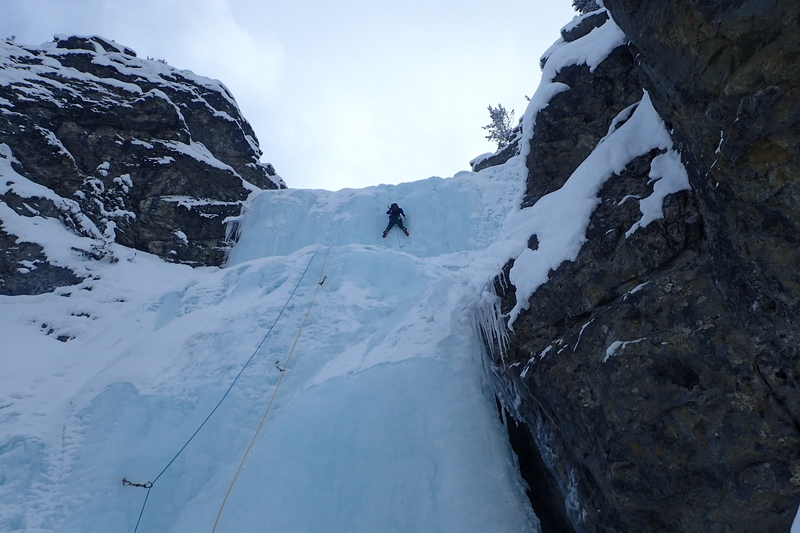 It was bit easier than previous long parts, so within my capabilities of leading ice (up to 3+). While Lar and I swapped leads for another section, which was of similar difficulty, PG enjoyed coffee and cigarettes. Lar leading his personal crux pitch. I don’t remember the second last pitch being there last year, but since it was, I grabbed the lead again. At this point, we still haven’t seen the top, crux pitch, and having known potential avalanche danger above it we still didn’t know if we wanted to do it. 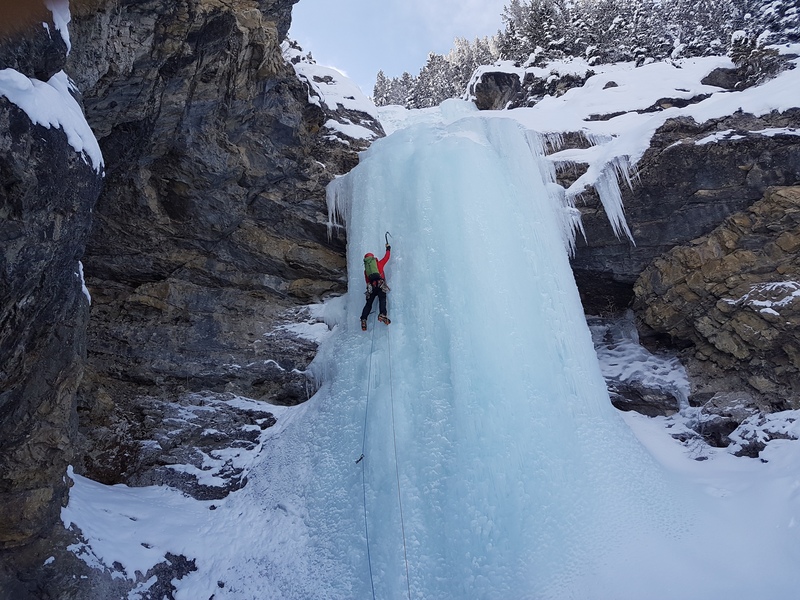 But once I got over that short section and seen the majestic, almost untouched piece of ice some 200m ahead of me, there was no turning back! It was in much better condition than last year. PG run it like there was no tomorrow, with Lar and I following side by side – just like we have done for all the other pitches. I must say that with a team of 3, this is a major boost to efficiency. There is no way you can be efficient without utilizing side-by-side seconding. Once a the top we didn’t waste time and run series of abseil to the base. It was obvious we will be walking back in dark, but with the almost full moon behind our back that only gave me an extra boost. Today we are taking a break. 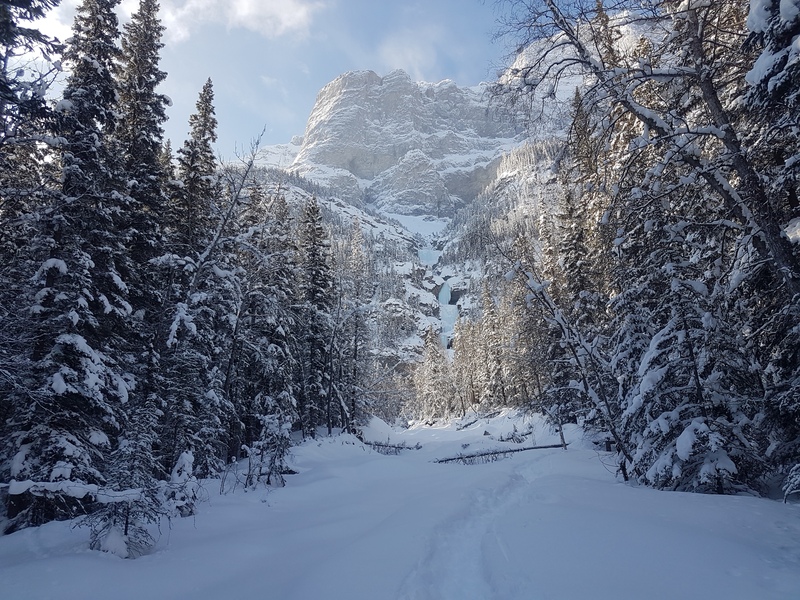 We got to re-supply, dry the gear (absolutely everything we brought home was frozen solid) and get ready to relocate to Lake Louise tomorrow (where we’ll be staying for the weekend).